I love to set a table. We always sit at the table to eat our main meal but I will admit that I don’t always set the table for this daily event. The lifestyles that we lead these days don’t allow for this, everything is always so rushed apart from on the weekend and some weekday evenings when I have the extra time and feel like going the extra mile. Sitting down to an elegant table setting is magical. I’m lucky to say I have a husband that cooks amazingly well and he is so passionate about it. He manages to turn a simple dish into something that tastes sensational. So when he is cooking then I will happily busy myself digging out fun bits to decorate the table with. He’s been at home a lot lately so we have been eating very well (and the scale will confirm that). I don’t think I’ve had a boring meal for some time now and I’m loving it! 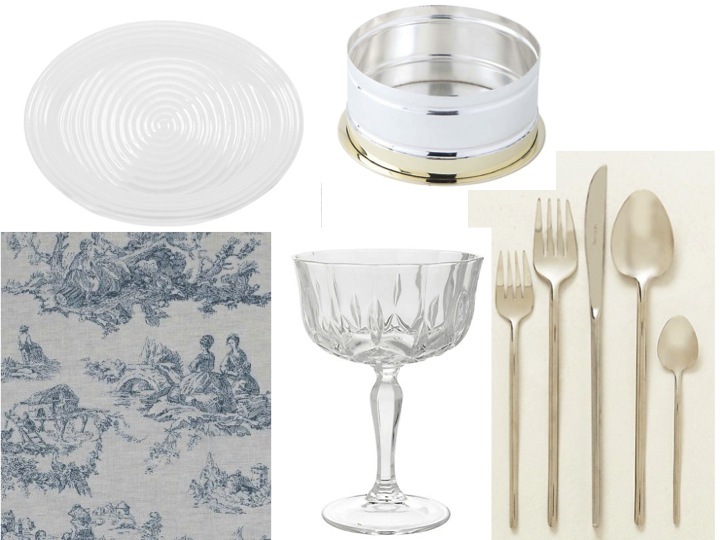 Below are some gorgeous tableware essentials for various sittings. A clean white breakfast table is so refreshing, especially as at breakfast the food can be so colourful with all the fruit that the best backdrop for this is simple. Although don’t get me wrong, if it’s summer alfresco dining at breakfast then a colourful table is my favourite. I love to mix and match prints, not only in clothing but also with interiors, and the same rule applies in both cases. Mix prints but keep the tones the same. 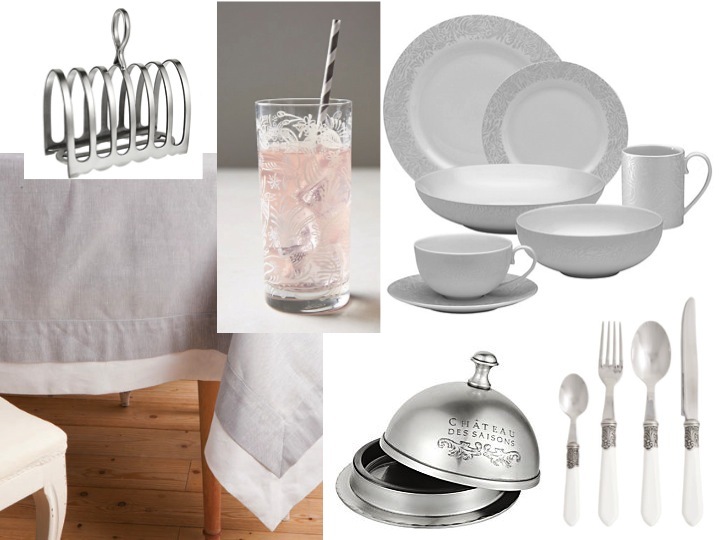 Silver or gold cutlery is so elegant. Adding a wine bottle holder is a lovely touch and will save your table linen from any drips too. I love this Toile de Poulet fabric from Cabbages and Roses, they may not have table cloths or napkins made up in all their fabrics but just buy a piece and make it up yourself. I could use it throughout my house and although I LOVE floral fabric I find this slightly more elegant. Pretty glasses are really important, or at least good sparkly glasses, once the dishwasher salt stains start to appear on glass they are no longer table quality. 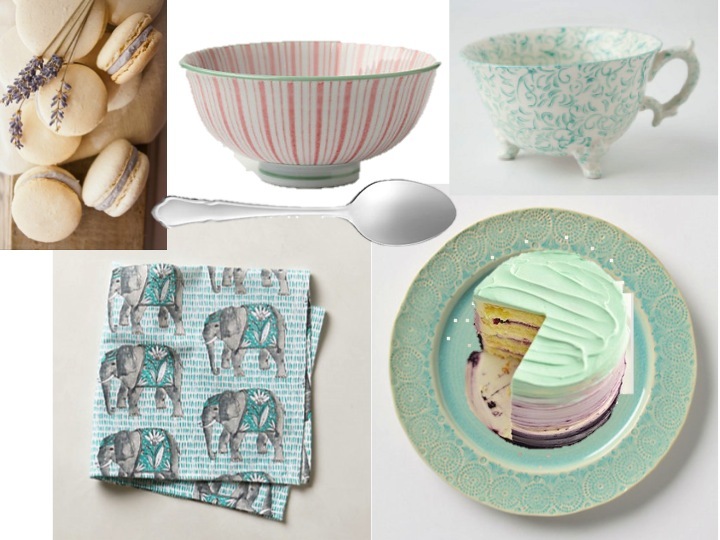 Perhaps some of these items will inspire you for weekend entertaining. Happy Friday!